This week’s post is going to direct you to four posts I have done for SMART Technology’s EDCompass Blog. I serve as a guest blogger and have done a series of four posts describing my journey as a SMART Exemplary Educator. This journey has also involved the development of the SWELL (SMART Worldwide Effective Learning Lab) classroom. The four titles are listed here and linked to the EdCompass Blog. Check out these posts! 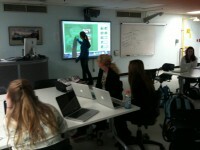 Could you Convince Your School to Put a SMARTBoard in Every Room? Also check out this video my class made about project based learning and the use of technology. To view the video click here. This week I am going to let one of my student’s words be the focus of my post. A couple of weeks ago you will remember I blogged about our basketball team (to read the post again click here). Well this week I would like to use a paper Cord Barricklow, a member of that team, wrote as a class assignment for an “I Believe…” statement. It is so exciting to have a student who combines leadership traits, faith, integrity, and values into such a balanced package. We talk a lot about leadership and life lessons in my classes and let me tell you, Cord gets it. But here I’ll let you judge for yourself. You’ll see why I say I learn from my students every day! I have taken the liberty of putting some of Cord’s most profound statements (in my opinion) in bold and italics for emphasis. Please join me in celebrating this young man’s beliefs. We can all learn from Cord. Enjoy! I believe in the fight to excel above others. To fully commit yourself into whatever your dream is and be the best you can be. You can achieve anything you want to with hard work and dedication. Know that you are the best at what you do. Never be average. In order to be the best, you have to believe in yourself and know that you are capable to be that star. You must have the Muhammed Ali confidence, Ali once said, “I am the greatest, I said that even before I knew I was.” It can be seen as cockiness but it is much deeper than that. It is an attitude, a swag to what you do and what you love. When you put all of your blood sweat and tears into a single goal, you have the right to know you are the best. You may not really like the training, it will get tough. Ali puts it into the best words. “Don’t quit. Suffer now and live the rest of your life as a champion.” That’s what has to fuel your fire. Sure, it is a struggle to maintain the level of determination to keep grinding it out, but without struggle what’s it all worth. Nothing is given to you in this world, and when you push yourself, you will get what’s necessary to be a champion. You may need some luck in your journey, but I believe that luck is hard work, cleverly disguised. With great skill and good luck, you can achieve anything. People are born for a greater purpose than to just survive. God put us on this world to thrive at the challenges we face, not just to turn away and survive them. And when you achieve that prize, that goal you have pushed for, you give him all the glory in your victory. I work everyday at the things I push to succeed in. Whether it is rodeo, basketball, or school. If I don’t consistently work on my game, someone else might be getting better than me. I cannot be average, I must find the push within me to get to the top, and stay there. And when you achieve the greatness that you worked so hard to obtain, you will know that you made it, that you are not average, that you’re a champion! This I believe! Today, as is the case most days, one of my students has provided the teaching and I am obliged to do the learning. 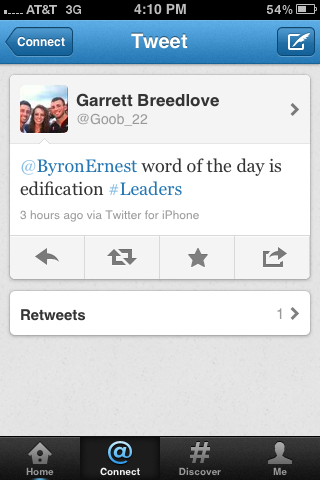 Garrett Breedlove (@Goob_22 on Twitter) tweeted me that the word of the day was “Edification.” You may recall that Garrett was the facilitator of learning for one of my blog posts last fall. To read that post (Attitude Is Like A Cold) again click here. Now I have to admit, I didn’t even know what “Edification” meant. So off to my Dictionary App I went, and guess what the definition was? “1. The act of edifying.” I hate it when that happens! 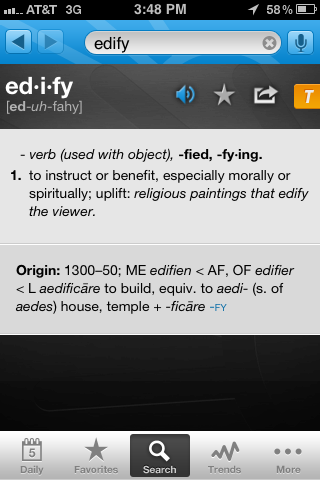 So, I looked up “Edify.” That’s when the learning began. Here’s what it said: “To instruct or benefit.” Now, that’s good stuff! Wouldn’t it be great if we were all edifying? That would mean we would be instructing or coaching and benefiting others all the time. What a great world it would be if we were all striving to “Edify.” I was then reminded of a conversation I had just yesterday with my good friend Kevin Eikenberry. I shared my frustrations with him about a leader of a meeting I was in the week before who had just not taken her own professional development serious enough and was, quite frankly, giving wrong information. I shared that I had gone back to his book Remarkable Leadership:Unleashing Your Leadership Potential One Skill at A Time and read the part where he talks about that as leaders we must always realize that the others in the room may not be at the same knowledge level or leadership ability as us. Kevin, in his normal wisdom, shared that we have to find a way to coach and provide that information to others in a way that benefits all. Next time you are in a situation like mine think about how you can “EDIFY.” It will make the world a better place. 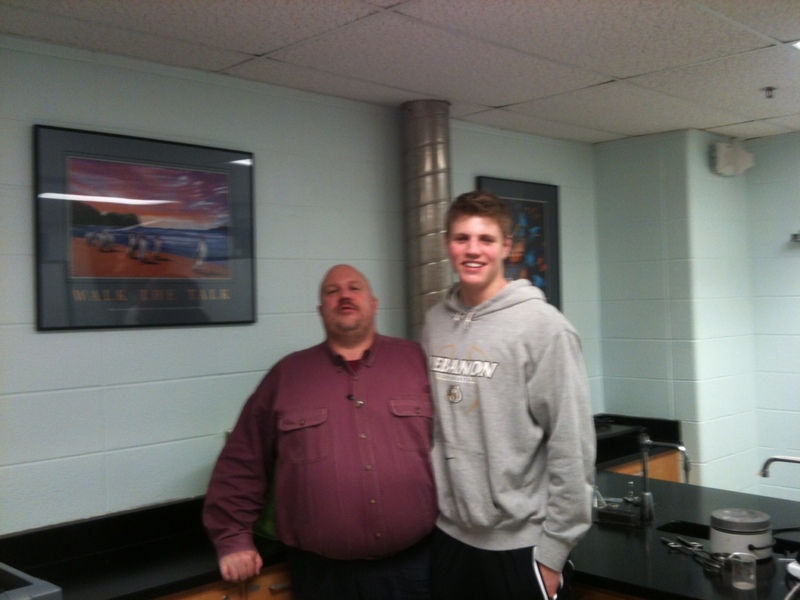 Thanks for the inspiration Garrett! Just goes to prove that Twitter is one of the greatest professional development tools ever.